Use this document to help you prevent a contractor or his staff from stealing your intellectual property. You may have software or formulae worth $ billions or you may simply want to protect the IP in a modest business. Your valuable IP could be anything at all: legal document templates; chemical formulae; photographs; software; or any other. You may be a large corporation or an individual business owner. The document you need is here, to protect your IP. 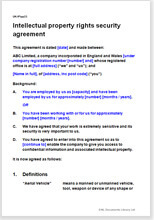 You may use this document either stand-alone or by incorporating relevant terms into your usual standard contracts. This is not a contract for actual work. It is more in the nature of a high level confidentiality agreement. By all means use any time, but particularly when you hire a person to work on a particular project, alongside a service contract. Most importantly, this contract does not just cover your contractor, but compels him to accept liability for his staff – even when they act outside their employment. Furthermore, it is worded so as to include both past and future work. New intellectual property may be created as the contract runs. This agreement makes sure that it becomes yours – even if an employee of the contractor thinks otherwise. What is more, for your best protection, the contractor binds his own staff to the terms of this deal. In summary, there is no way that either a contractor or his staff can steal your intellectual property. That way, you are able to sue the contractor for unlawful acts of his employees or sub-contractors. The law relating to ownership of intellectual property in newly created rights varies from country to country, so it is particularly important to use this agreement as part of any arrangement for supply from outside New Zealand. For double certainty, the ownership question is enforced by a long-stop provision for the forced legal transfer to you of any rights that he could still argue about. This agreement covers all variations and situations by absolute clarity of the proposition that the payer owns all the IP rights he has paid for. This is enforced by a long-stop provision for the legal transfer of whatever rights could slip through the net. The agreement moves seamlessly through confidentiality, particular projects, “work for hire” and past and future intellectual property. Over 1,950 words of helpful drafting notes.